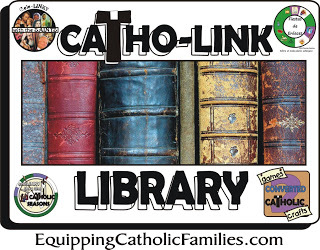 I hope you enjoy the Catho-LINK LIBRARY, borrowed from Equipping Catholic Families. Please add your own Catholic Link-Up parties, visit these links and add your own Catholic crafts, activities, celebrations and traditions to the various linkies! Don’t forget to grab the Catho-LINK LIBRARY button for easy reference and place it on your blog, linking back to the Catholic Bloggers Network. Scroll down to the bottom of this page for the button code. Thanks!